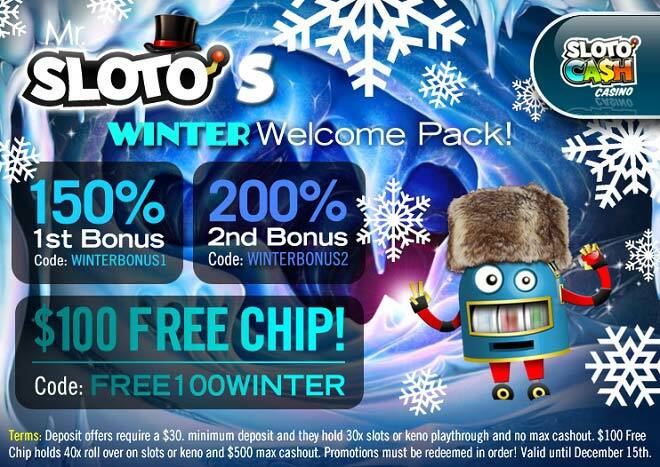 Mr. Sloto's Winter Welcome Pack + $100 FREE! While most of you are used to breaking out your mittens and making snowmen in your front yard during the winter holidays, Mr. Sloto would like to do thing a little differently this year and help you keep warm during the first 15 days of December! Deposit as little as $30 and cozy up by the fire of wins with a 1st 150% Bonus, a 2nd 200% Match and wrap up in a blanket of cash with a $100 Free Winter Chip! Plunging temperatures and long nights are the perfect time to keep warm with Mr. Sloto’s Winter Pack of Bonuses and $100 Free just in time to celebrate Christmas!